Inspired by: My good friend Sue who is amazing with both food preparations and wine and champagne selections! 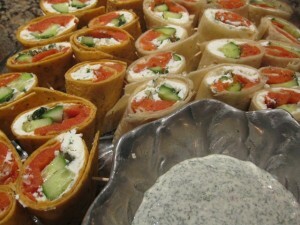 This was one of the several dishes she brought to a gourmet thanksgiving dinner party this year. Even those who don’t normally like cranberry sauce really enjoyed this refreshing side dish. Chop cranberries with sugar in a food processor and then dump into a large bowl. Pull the stems off of the Kumquats and cut into halves. In the same food processor (no need to clean), chop the kumquats with the ginger. Dump the kumquat-ginger mixture into the bowl with the berries and mix well. Refrigerate and serve the next day. Notes: This is more of a light fruity salad than a relish/condiment, so I categorized it in both places. Inspired by: Rikke’s vegetarian lasagna with homemade pasta and a layer of pesto! This was the most amazing lasagna so when I tried to come up with a lasanga recipe that would be similar, I wanted to make my own pesto oil and concocted the below. Now I use this on pasta and in veggie dips. It’s so easy. Preparation: Blend all ingredients well in a food processor. Serve with: Awesome on pasta. 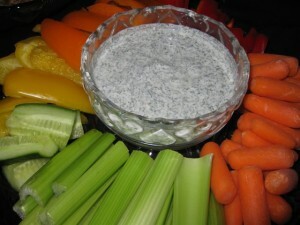 I use this in my grilled vegetable lasagna and white bean pesto dip. 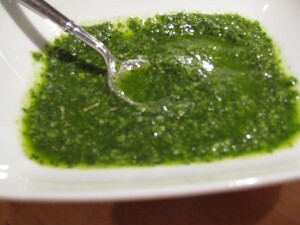 Wine suggestions: I have heard that pesto can be a good pairing with Cabernet Sauvignon. I can see how that might be true with a pretty rich dish that uses a lot of pesto. Inspired by: my super sweet, ex mother-in-law, Betty Moore, gave me this recipe! She always made the yummiest sandwiches, and this mustard was one of her tricks! I almost always keep some in the fridge as it is awesome on everything. This is a sweet and quite spicy mustard. The Coleman’s Dry Mustard gives this a sinus-clearing bite similar to fresh horseradish. In a large, microwave-safe bowl, blend all ingredients together with a whisk or on a low to medium speed with an electric mixer. I usually start with the eggs, add in the sugar and salt, and then the dry mustard and vinegar. Microwave for 2 minutes. Remove and stir well. Repeat 3-4 times until it is as thick as you’d like it to be. It will also thicken up quite a bit when it cools. Makes between 1 pint and 1 quart. Notes: It’s best to make this a day or more ahead as it will cool and thicken up – making it easier to spread on wraps or sandwiches if you don’t want it to “run”. 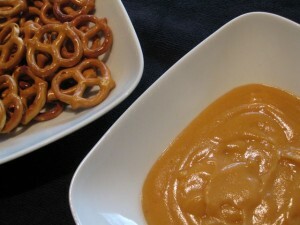 When I know I’ll be using it as a spread for wraps I usually make it a little bit thicker with an extra cycle or two in the microwave.I love using it warm as a pretzel dip as well! Inspired by: various yogurt sauces used in combination with spicy cooking – I was looking for a nice flavor balance with some curried chicken kabobs and have since found that this sauce is fabulous with so many different things! Preparation: Mix all ingredients well in small bowl. Add salt and pepper to taste. Notes: Lasts for a while in the refrigerator but the garlic gets stronger over time so if you plan to keep it for a while, I suggest using little or no garlic. 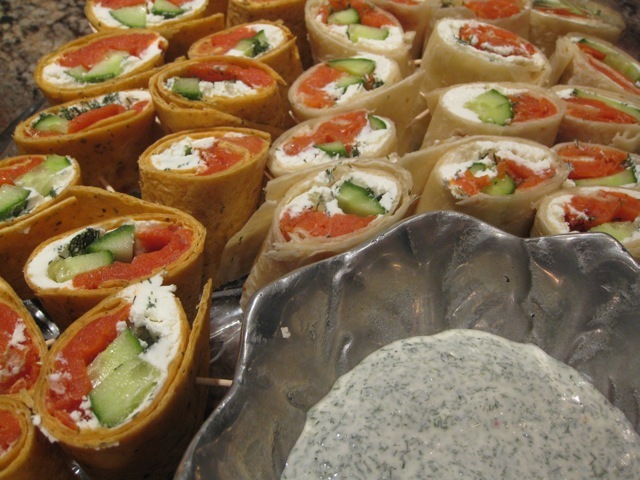 Serve With: Curry chicken kabobs, any other spicy meat or poultry, fabulous on salmon or as a dip for a smoked-salmon wrap, and great alone as an appetizer dip with raw veggies or bread.